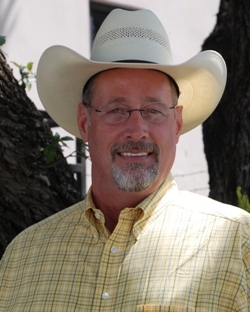 Jim Banner is co-owner of Southern Livestock Publishing and has over 25 years of experience in the field of livestock publishing, advertising and marketing. Banner grew up in the Texas Hill Country where his family raised commercial cattle in Llano County. He was active in 4-H and FFA participating in livestock judging and showing. He was the past recipient of the 4-H Gold Star Award and participated in the Farm Bureau Youth Leadership Program. He earned a Bachelor of Science degree in Agricultural Education from Texas A&M University in 1981 and was a member of Saddle & Sirloin and Collegiate FFA. In 1983, Banner began his career with Gulf Coast Publishing located in San Antonio, Texas. He was assigned the job of advertising director for the The Beefmaster Cowman magazine, the official publication for Beefmaster Breeders United. In this position, he learned the publication business including advertising, photography and cattle marketing. In 1989, with business partner Michael Sturgess, he formed Southern Livestock Publishing, a multi breed, bi-weekly newspaper which serviced the area located in the southern portion of Texas. In 1993, he was instrumental in starting the San Antonio Livestock Show & Rodeo All Breed Bull and Female Sale. Banner is a member of the Independent Cattleman’s Assn., Texas and Southwestern Cattle Raisers Assn. and has been active in the Texas A&M Beef Cattle Short Course. 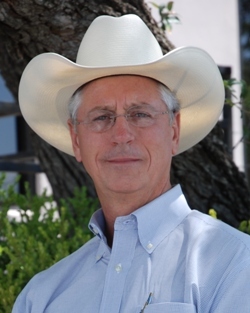 Loren Jackson brings a wealth of beef cattle knowledge to Southern Livestock Publishing with over 30 years of experience in numerous aspects of the beef business in addition to a strong background in advertising, promotion and marketing. Jackson was raised on a diversified farming and registered beef cattle operation in Mechanicsville, Iowa. He received a Bachelor of Science degree in Animal Science from Iowa State University in 1978. Jackson was a member of the ISU Livestock and Meat Judging Teams accumulating an array of livestock judging and beef showing awards throughout the United States. Upon graduation from college, Jackson was employed by the American Hereford Association in Kansas City, MO. In over ten years of service with the organization, Jackson served in a number of positions including: Associate Editor of the Hereford Journal, Director of Shows, Director of Youth Activities and Total Performance Records Field Director. In 1989, Jackson joined the staff of the International Brangus Breeders Association, San Antonio, TX as the Director of Brangus Herd Improvement Records. During his nearly eighteen years of service with the organization, he served in several positions and was instrumental in developing and advancing a number of new and innovative programs for IBBA. Jackson served as IBBA Executive Vice President from 2001-2004, and also held positions as the Director of Research and Program Development, Director of Commercial Marketing and Director of Shows during his tenure. Under Jackson’s direction with IBBA the association made great strides including the development of the first beef cattle ultrasound carcass EPDs, implementation of the Commercial Marketing Program, Commercial Brangus Edition, International Marketing Program, Brangus Summit, DNA Parentage Verification, Herd Selection Indexes, International Marketing Program, Brangus Derivative Program and the breed’s first online cattle registry and performance data tracking system. Jackson has served the beef cattle industry in a number of leadership positions having served on the board of directors of the Beef Improvement Federation, Ultrasound Guidelines Council, Texas Purebred Cattle Alliance, American Breed’s Coalition, Brangus Publications, Inc., U.S. Beef Breeds Council and the National Cattlemen’s Beef Association Research Committee. Born in 1960, Michael Sturgess was raised in Dumas, Texas, in the Texas Panhandle. He grew up on the family farm where they also operated a purebred swine operation and ran stocker cattle. The Sturgess family still remains the only family to produce and show back-to-back grand championships in the Houston Stock Show’s Barrow show in 1980 and 1981. Michael graduated with a Bachelor of Science degree in Ag Business from Lubbock Christian University in 1982, where he was a member of the Livestock Judging team. 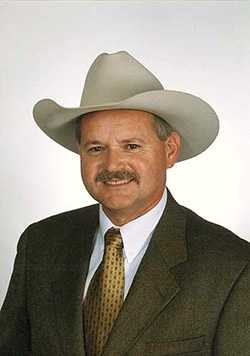 He later served two years in 1984 and 1985 as the Executive Secretary of Texas Brangus Breeders Association, headquartered at the time in College Station, Texas. In 1986, Michael moved to San Antonio, Texas to accept a fieldman position with Texas Farm & Ranch News. Later in that year, he married his wife of 23 years, Lauren. They have one daughter, Shelbi who attends Clark High School in San Antonio. It was also during this time period that he met his current business partner, Jim Banner. Michael and Jim joined forces in 1989 to form Southern Livestock Publishing, Inc. They began publishing the Southern Livestock Standard (SLS) newspaper in August of that year. Since that time, SLS has served the commercial and seedstock industries with great distinction. As co-publisher, Michael has served the company and its valued customers in many capacities, including advertising sales, advertising development, consulting with customers on advertising and marketing both purebred and commercial replacement females and ring service. Since 1992, Michael, partner Jim, and long-time friend and customer Anthony Mihalski, have also served as sale managers for the annual San Antonio Stock Show & Rodeo All Breeds Bull & Commercial Female Pen Show & Sale, held each year during the Stock show. This event has grown into one of the premier annual events in the cattle industry with buyers coming from as far West as Arizona and as far East as Florida. From 1989 to 2003, Michael also authored a monthly column entitled “Just Your Standard Bull.” Ranging from mildly amusing to more serious topics, he has focused more on serving the seedstock sector of the cattle industry, particularly in the areas of promotion and marketing. From May of 2003 to May of 2008, Southern Livestock Publishing served as publisher for the Brangus Journal, a monthly magazine serving the members of the International Brangus Breeders Association (IBBA). Michael managed this endeavor and re-focused much of his time and duties towards serving the needs of its customer base through advertising, promotion and marketing consultations, ring service and photography. During this time, IBBA members witnessed their publication grow in size, scope and overall quality. Since May of 2008, Michael has devoted his time to serving Southern Livestock Publishing’s expanded customer base due to the launching of SouthernLivestock.com, which was created to serve producers operating in the Southern U.S. Michael will also work closely on the transition of Southern Livestock Standard from a Texas publication, to one that mirrors the same territory as SouthernLivestock.com. Michael is also a licensed agent through Silveus Insurance Group. He specializes in drought insurance for cattle producers with a product called a Pasture, Rangeland and Forage (PRF) policy.